Google has announced plans to continue receiving a good chunk of info for its Maps application from Tom-Tom-owned Tele Atlas. The Dutch navigation information provider has been working with Google for the past three years, and Tele Atlas told TechRadar it is one of the biggest providers of mapping and other information. The press release makes it seem like the deal is going to boost Google Maps in some way, but in reality the extension is really just a validation of the service it has been providing. "This is basically an extension of the previous deal," said a spokesperson for Google. 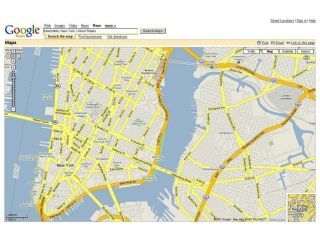 "It gives Tele Atlas access to users' edited maps, as we have the capability for users to change a map if they see fit." Apparently, this is likely to be the only change to the service, so thoughts it would provide some level of greater interaction with Google Maps for Mobile or the forthcoming Android appear to be wide of the mark. However, Tele Atlas did confirm to Google it is looking to increase the partnership in the future. "We are the biggest provider to Google, which enhances the level of interaction we can achieve," said a spokesman for the company. "We are also looking at ways to increase this in the future, although it is a non-exclusive contract."